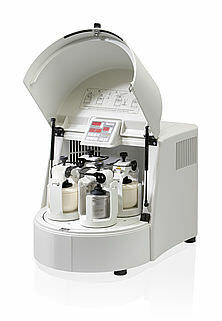 The P-5 planetary mill is ideally suited for rapid batch Grinding down to colloidal fineness. Material may be either dry or in liquid for wet grinding. Maximum fineness is about 1 micron. Effective grinding capacity with 500 ml containers is 225 ml x 4 for a total material volume of 900 ml. Maximum feed particle size is 10 mm (0.4”). The P-5 is available in two configurations, the P-5/2, which uses 2 grinding containers, or the P-5/4, which uses 4 grinding containers. Electrical requirements are for either 115 V/1 Ph/60 Hz or 220 V/1 Ph/50 Hz. At right, the P-5/2 is shown with 2 agate 80 ml grinding containers.